A recent student enquiry asked for clarification on Thomson ONE.com. The simplest approach is a screenshot and explanation following our guidance in the Referencing Guide at the University of Manchester – Harvard Referencing Style. Often it is appropriate for the figure caption to be relatively short and the text referring to the figure to give the details of the source of the data. It should be clear whether the figure is directly provided by the financial database as in this screenshot (Thomson ONE.com, 2013), or the figure is of your own design using data obtained. The reference year (in this case 2013) will normally be the same as the year accessed. Even though the company accounts information in figure 1 is only till 2010, the web page was dynamically generated in response to a request made in 2013 and therefore is “published in 2013”. The reference year can differ from the year accessed when referring to the document that has its own date. 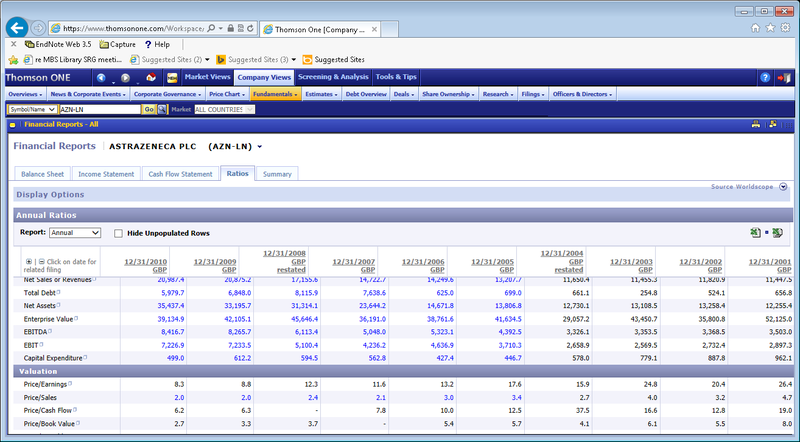 For example the AstraZeneca annual report for the financial year ending 31 December 2010 is published in 2011 and available through Thomson ONE.com (AstraZeneca, 2011). The URL in the reference (see below) is a compromise. Thomson ONE.com is a subscription service so the URL is of limited value to readers who do not have access. On the other hand the URL does provide additional confirmation to readers who have Thomson ONE.com access. The recent blog post Market Mood Swings: Facebook Euphoria shows that company valuation is not just about getting the data values and plugging them into an equation – it is also about judgement. This is the most recent of several posts that provide an interesting commentary on how the markets have priced Facebook since its IPO. What was the blog created for? Why was the blog created? When was the blog last updated? Who owns the blog and who posts to it? Where has the content come from? The content has come from Aswath Damodaran’s professional expertise and business news. It is not very surprising that the indications are that this post will provide information from a timely, relatively unbiased, academic perspective. It is not providing a valuation of Facebook to persuade you to buy or sell the stock or subscribe to a commercial information and/or trading system. Other valuations of Facebook – try analysts’ reports. There is a new version of the University of Manchester Harvard Citation Guide. Follow the Guide to Referencing at the University of Manchester link on the Business and Management Referencing tab. You can download the guide as a pdf file, or read the advice online. The Guide to Referencing at the University of Manchester (now renamed Referencing guide at the University of Manchester) includes tabs on referencing software: EndNote, EndNote Web, Reference Manager, Zotero and Mendeley. Based on our popular “Guide to citing references guide (2012)” here are recommendations for citing specialist company and financial databases. Mintel. (2009) Books – UK – December 2009, Market Research Report. [Online]. Available at : http://reports.mintel.com/sinatra/reports/display/id=395633 (Accessed: 05 January 2010). Meltz, M. A., Lewis, D. & Lovell, N. (2009). [J.P. Morgan report on] The McGraw-Hill Companies – 07 Dec 2009. Thomson Research Investment Research Collection Rpt. 15613728 [Online]. Available at: Thomson Research – http://research.thomsonib.com/ (Accessed: 05 January 2010). If we consider a database as similar to an e-book then the first decision is whether you are citing the complete database or a separate identifiable part of the database. Where a company has several databases it is easier for the reader if you use the database name as the author. This means that the in-text citation will be (Datastream, 2012) rather than (Thomson Reuters, 2012a) and the reader has to go to the list of references to find which Thomson Reuters database you are citing. In some academic writing there are alternatives in how to cite the source, or sources, you have used. You can put all the information where the original data is described, or you can include a citation in the text with the full detail in the references. Figure 1 shows comparison of share price return and total return. Graph obtained from Bloomberg Professional, online subscription service, (Accessed: 3 December 2013). Figure 1 shows comparison of share price return and total return – graph obtained from Bloomberg (2013). For student academic reports the second option has the advantage that anyone reading the references is reminded of the data sources used. If you are submitting to an academic journal then you should follow the guidelines for that specific journal. 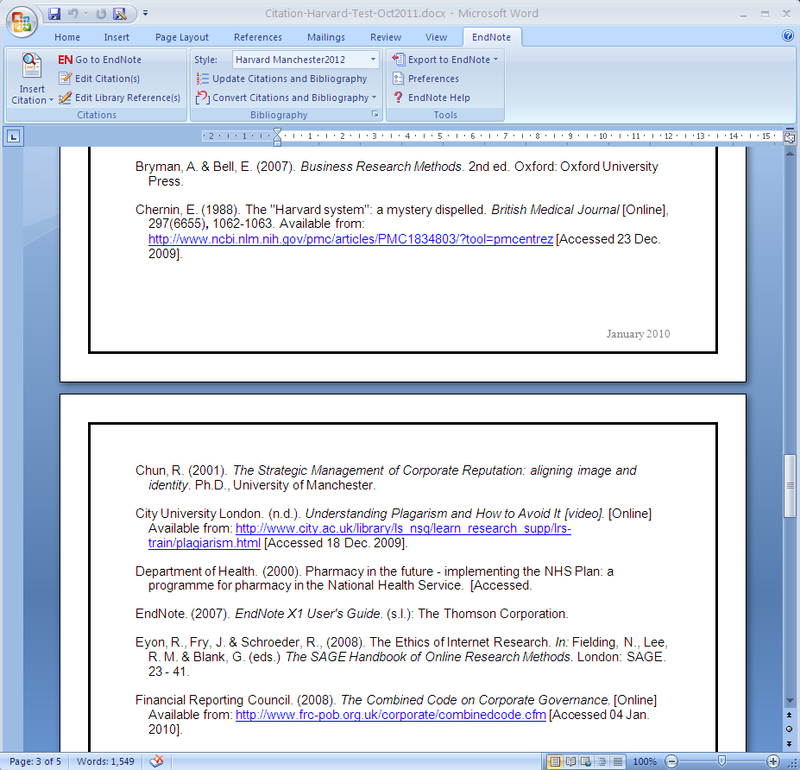 here is a Referencing Tab in the Business and Management subject guide. You can also browse the other posts in the referencing category. We had a query about the availability of the Harvard Manchester EndNote style. One of the problems of the Harvard citation style is that there are lots of variants. In 2010, we developed a Harvard Manchester EndNote style based on our referencing guide, Hynes, J. 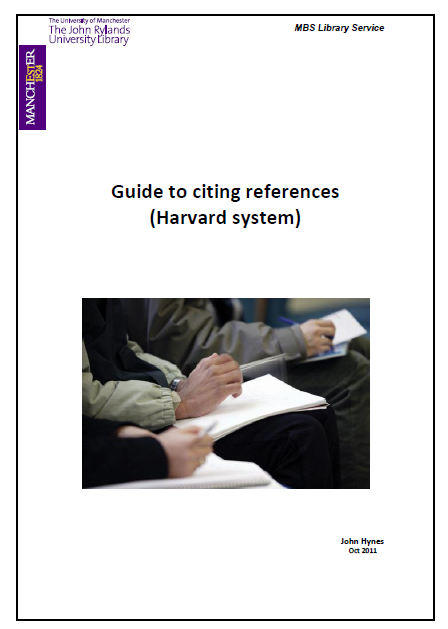 (2010) “Guide to citing references (Harvard System)”. – see Dec 16 2010 post Citing References in Harvard Style. John Hynes updated the guide in October 2011, but a revised EndNote style is still in draft form. The changes are relatively minor so you have to be quite pedantic to spot the differences, and we are increasingly aware that that students are choosing alternative reference management software. (Having to buy EndNote for your personal laptop is a significant barrier.) see Dec 3 2011 post Referencing – new guide and software options. If you want to edit either of these EndNote styles to match your requirements there is the FAQ answer for How can I edit an EndNote style? If you have suggestions for improvement then please leave a comment. New Emerald app – Journal Articles on the Go! As part of our commitment to supporting you with all your research needs, over the last few months we’ve been recommending some useful business apps for you to download to your tablet devices, some of which are for accessing our databases and some which are for useful external sources. The launch of Emerald’s first app provides a feature-rich interface with which to find, read and save Emerald academic journal content if you’re on the go. Showcasing a clean and easy to use design, the app makes searching and browsing for journal content an intuitive and time saving experience. As Emerald subscribers, our customers need simply download the app for their own device and use the search and browse options to start finding content immediately. Find what you need, when you need it: Search and browse Emerald’s extensive online content library of almost 100,000 journal articles. Personalise your experience: Use your Emerald profile to manage your marked lists and saved searches. Spread the word: Email links to your friends/colleagues and share content via the built-in Facebook and Twitter functionality. Enhance your knowledge: Read full-text content through the integrated browser. Most content is available in easy to read PDF format too. The Emerald app is optimized for the iPad and compatible with iPhone and iPad touch. It requires iOS 3.0 or later and is available free of charge from your app provider. Remember if you’re using an iPad make certain to add the MBS Library Service page to your Home Screen for easy access to all the Resources we have to offer you for your research. Simply open our page then tap the arrow in a box symbol next to the top URL line and then select “Add to Home Screen”. You can even edit the name of the Web Icon, after you’ve done this – tap the “Add” button. The 2011 version of John Hynes’ “Guide to citing references (Harvard system)” is proving to be the most popular of our How to research guides. The guide provides a brief introduction to referencing: both citing references to others’ work within the text of your assignment/thesis/paper, and compiling an accurate list of references. A) Pears, R. and Shields, G. (2010) Cite them right: the essential referencing guide. 8th edn. Basingstoke: Palgrave Macmillan. B) FISHER, D., and HANSTOCK, T., 1998. 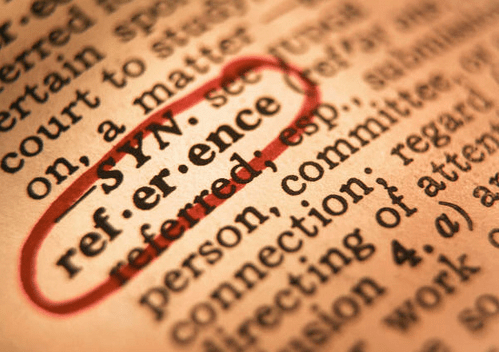 Citing references: a guide for students. Blackwell. The guide chooses A because all Manchester Business School course handbooks use uppercase and lowercase for authors’ names, rather than all uppercase (and an unscientific survey of descriptions of Harvard referencing had most with the publication year in brackets). Manual (e.g. Word) – Simply create yourself a “my references” document, and as you read a paper/book/… add all the necessary reference information. When writing do your referencing by hand: cutting and pasteing from your references document as appropriate. EndNote – A sophisticated reference management system, available on all University of Manchester cluster PCs and supported by Library training sessions. ( JRUL EndNote Page, Endnote FAQs ) However you have to buy a personal copy to use on your own laptop (academic discount available). EndNote Web – Free to University of Manchester staff and students with our site licence for EndNote. (JRUL EndNote Web Page, EndNote Web FAQs) Well worth a try before buying your own personal copy of EndNote. Mendeley – Free reference management software like Zotero – adopts support for collaboration as its unique selling point. If you have a small number of references it is relatively easy to do your referencing manually. However using reference management software can be a big help in getting your references organised and making it easy to produce a consistent professional set of references like you see in academic texts and journal articles.